The SRP2100, flagged by maker Topfield as the 'Total Media Solution', is a well-specified twin-tuner 500GB HD satellite PVR that also boasts compatibility with online content like YouTube, Flickr and ShoutCast internet radio. You can also transfer compatible multimedia files to it from a PC, again via a USB storage device, web interface or FTP (File Transfer Protocol). With appropriate network setup, remote control of the receiver from anywhere in the world with an internet connection is possible. Topfield even includes a wireless keyboard, and USB dongle. The SRP2100 redefines the luxury receiver. A sophisticated receiver needs a sophisticated look, and the surprisingly compact SRP2100 is actually quite close to some cutting-edge Samsung products – maybe it's a Korean thing. The front panel's most conspicuous feature is a bright-blue backlit circle that defines a somewhat fiddly touchpad. From here, you can select channel, adjust volume and access menus. To its left is a fluorescent display for channel indication, menu names and so on. On the right is a pull-down flap that conceals a pair of USB sockets and two CI slots. It looks as if Topfield was considering a built-in card reader – and thus CAM emulation – but no such luck; the slot is, alas, filled in. The accompanying handset may look good but its keys have a horrible plasticky feel and is disappointingly unresponsive on occasion. Thanks to pre-programmed codes it will operate some audio equipment, DVD players and TVs – but a button for favourites lists access is absent. The rear panel hints at the SRP2100's potential. Each of the two DVB-S/S2 tuners has an input and loopthrough output – if you're using a single dish one tuner can be looped to the other. However, you'll lose much of the unit's viewing/recording flexibility. For HD (and upscaled standard-def) video, component and HDMI outputs are included. The HDMI output provides bitstream or decoded (PCM) digital audio. You also get coaxial and optical digital outputs. 'Legacy' Scarts for TV and VCR, plus a composite video and analogue stereo output are also present. The TV Scart supports RGB, but if you're using the component or HDMI outputs the best you can hope for is S-video. For attaching external storage devices, eSATA and USB ports are provided. Finally, we have the Ethernet port that plays such an important role in the SRP2100's capabilities. A wizard is responsible for basic settings. From here, languages are specified and you can specify an initial satellite for searching. For anything more advanced – motorised dishes, for example – manual configuration is required, courtesy of the pleasantly designed main menu's 'installation' option. Within this are various submenus for searching, transponder/satellite editing, LNB options and motorised dish (DiSEqC 1.2/USALS) setup. From these menus, a transponder and satellite can be selected – signal strength and quality bars (in large 'extended' form if desired) are displayed. You don't get the audible signal metering of previous Topfields, though. For each tuner you must specify LNB details, whether DiSEqC 1.0/1.1 is used, and whether they're separated or 'looped through' with a jumper cable. You can then automatically search for channels – free-to-air only, encrypted only or all channels (network search is also possible). Unfortunately, blind search is not available in hardware or software form. Manual searches allow you to concentrate on single transponders, which can be edited or defined manually with an installation-menu 'sat/TP Edit' option. Polarity, frequency and symbol-rate can be entered here. In the third 'advanced' mode, you can also enter service PIDs. Such a feature can be useful for 'non-standard' channels like ITV HD; although this was found, the SRT2100 thought it was a radio channel. You can't alter the parameters of existing channels on the same transponder to facilitate reception, either. 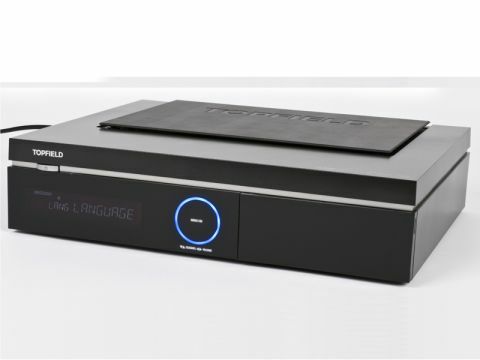 Channel databases can be 'copied' between the two tuners – although such duplication eats into memory, it ensures that your viewing/recording options are unimpaired. DiSEqC motor settings, which are independent for each tuner, have separate installation menu options. In theory, you could have two different motorised dishes! If only one is motorised, this should be connected to the first LNB input. If you're using a USALS dish mount, site latitude and longitude can be entered for automatic determination of satellite positions. Here, a 'go-to' function will let you enter the orbital position of the bird you're after. Multi-satellite searches are, unfortunately, not catered for – some receivers, in contrast, will allow you to select several birds from a list. Also in the installation menu are options for firmware upgrades (via the network/USB or 'over the air'), network settings (by default, DHCP assigns an IP address to the receiver automatically) and 'service' (channel) editing. From the latter, you can sort through the channel list in several ways – FTA/CAS, provider, satellite, alphabetically or favourites. Channels can be deleted, locked, moved or renamed. New favourites lists can be created from here, or the four existing ones renamed. The second configuration menu – 'settings' – is concerned with a range of other parameters that include recording/ playback (PVR timer start/finish 'padding' and timeshift buffer size, for example), EPG options, parental control, time (including the allocation of a specific transponder for 'syncing') languages, clock and AV output options like resolution ('video format'), aspect ratio and Scart signals. For some reason formatting was stuck to 'auto', even when using a component or HDMI connection. The handset's video format button had no effect. Pressing the remote's 'enter' button displays the channel list. All of those previously found services can be sorted alphabetically with the yellow 'fast-text' (context-sensitive) button, while the green button allows you to select one of the favourites lists. The white 'options' button effectively shortcuts to the additional channel sorting, locking renaming and delete options of the service editing menu. From here, it's easy to place a channel into one of the favourites lists. You simply highlight the desired channel and select the list you want it in. A nice touch is the ability to choose satellites directly via a dedicated handset button. The 'info' button calls up EPG information about the current programme and basic channel data. Teletext is supported, the unit having its own decoder on board. Well, in theory at any rate. For some reason it wasn't working on our test sample (which was equipped with the latest firmware). The EPG is an interesting proposition. As an alternative to now-and-next and seven-day DVB schedules acquired 'over the air', it can be updated by the MediaHighway service carried via an Astra 1x transponder. Sadly, the MediaHighway EPG focuses around European pay-TV channels and so is of limited use in the UK. This is a pity because mainstream UK channels only off er now-and-next schedules to FTA receivers. The EPG has two modes. One arranges the programmes of up to seven channels in a conventional horizontal timeline, while the other vertically displays the schedules of up to five channels in hourly 'chunks'. Scheduling recordings is as easy as it is with our Sky+ yardstick, although there's no series link here. Highlight the desired channel and click the remote's enter button to automatically change channel; clicking it again schedules a recording – up to 70 can be accommodated. Another neat feature is the PiP display made possible by the dual tuners. The inset 'sub' and main picture can both be standard and/or hi-def – more than can be said of Technisat's less-flexible HD-S2X, which only has one DVB-S2-capable tuner. Selecting the channel for the 'sub' picture, which can be repositioned if desired, is invoked via the options button. When you're viewing a channel it's always being buffered to the HDD and so you can wind back and enjoy other playback trickery (including pause and slo-mo). An unsung bonus is that if you decide a programme's worth keeping it's possible to go back to its beginning and – using the record button – preserve it permanently. Thanks to the twin tuners you can watch one programme while recording another. When you're recording the channel list highlights channels that you can tune into. Strangely, the list of available channels seems a little sparse – they're all on the same transponder as the one being recorded. This is because you have to manually switch to the other tuner (via the options button) if the channel you're after is on a different transponder. Not very convenient. Why can't such switching take place automatically? Theoretically, several channels could be recorded simultaneously if both tuners are used – the reality is a limit of two channels while a third (or previous recording) is being viewed. Manual recording can be set to stop automatically after a preset period, or after the current/next programme finishes. Recordings are in the MPEG-2 format, but no provision has been made for editing. They can, however, can be transferred to a PC via FTP (the archaic WS-FTP works well, although more recent programs like SmartFTP could also be used) or via the web interface (enter the unit's IP address into a web browser). In doing so, we discovered that the SRP2100 records additional data (such as the PMT PIDs of other channels in the same multiplex). As a result more HDD space is consumed than is necessary. The aforementioned web interface also allows you to check on system information (recordings currently in progress, available HDD space), add/modify/delete timers or transfer multimedia files from the PC. On which subject, the onboard multimedia playback features – which live in the main menu's 'entertainment' option – rank among the best we've come across. The SRP2100 is compatible with a good range of file formats, including DivX/XviD, JPEG (complete with slideshow) and MP3. We also discovered that it will play hi-def x.264/mkv content which, to our knowledge, is a first for a multimedia satellite receiver. However, MPEG-2 files won't play – odd, considering that's how standard-def TV is broadcast in the UK. In addition, the files need to be transferred via USB/SATA, FTP or the web interface. Given the Ethernet capabilities, we would have appreciated an inbuilt networked media client able to stream content stored on networked storage (NAS) or PCs. We hope this feature will be added in a future firmware update. However, the SRP2100 is able to stream some content –front ShoutCast internet radio and YouTube. For YouTube you're given a choice of the site's most popular clips. However, the ability to search for clips by name is also provided. Multimedia options include weather forecast feeds, Flickr photo browsing and a 'Battle Tank' game which is the only included application to make use of the supplied keyboard. As it's a high-end receiver you would expect the SRT2100 to deliver in audio-visual terms – and it largely doesn't disappoint. Tuning into the BBC HD channel with a Samsung Full HD LCD TV reveals that picture and sound quality are more than a match for our reference Sky HD box, with pristine detail and colour fidelity. Going from a HD channel to a SD one yields the expected drop in quality, although the magnitude of the drop depends on the channel in question – some of the lower-rung channels suffer from noticeable artefacting. That was with 1080i upscaling; the apparent bug mentioned earlier means that we couldn't pass standard-def channels to the component or HDMI outputs in their original (576i) state. Similarly, we were also unable to assess the quality of the RGB Scart output although S-video yielded excellent results. At the other end of the quality scale YouTube clips looked worse than even the lowest-bitrate satellite broadcast. That's par for the course, though. One cannot complain about the sound, whether from TV/radio channels or well-encoded high-bitrate MP3 files. Having said that, the cooling fan can be quite intrusive on occasions. The photo playback function is welcome, but the obvious drop in detail suggests that multi-megapixel pics are internally downscaled to standard definition before being upscaled. The Topfield SRT2100 isn't the fastest receiver we've tested when it comes to searching, but it's far from the slowest. A full-service scan of the preset Astra transponders found over 800 DVB-S/S2 TV channels and radio stations in just over six minutes. Sensitivity-wise, the SRT2100 was judged to be better than average – it was able to provide usable results from some weaker transponders. Switching between channels is responsive, unless your dish has to move to another satellite (which it does automatically if necessary).